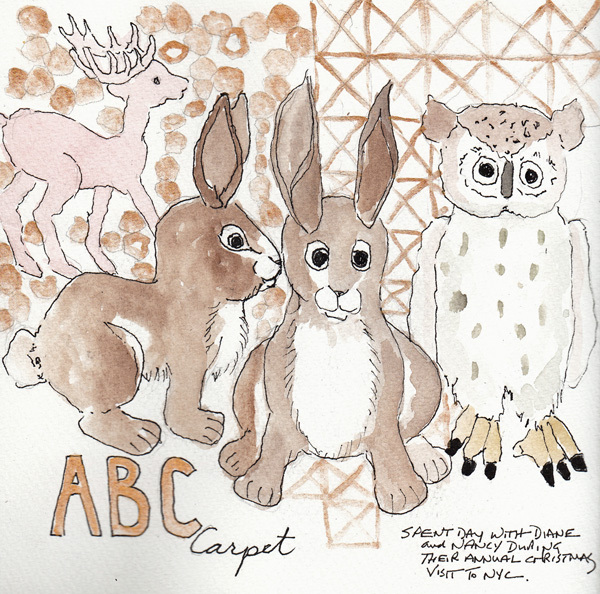 I was waiting to meet friends from DC at ABC Carpet, which is a winter wonderland each holiday season. Each year we look at the displays and get so many ideas for colors and decorating. I took the time while waiting for them to draw a few of the animals that were part of their displays. We did some shopping at Fishes Eddy and Flying Tiger, also on Broadway around Union Square, and then in the afternoon spent a few hours at the FIT Museum exhibits. Photography was not permitted in the Proust's Muse (Countess Greffulhe) exhibit, but these were elaborate clothes from another era and too hard to draw on the fly. 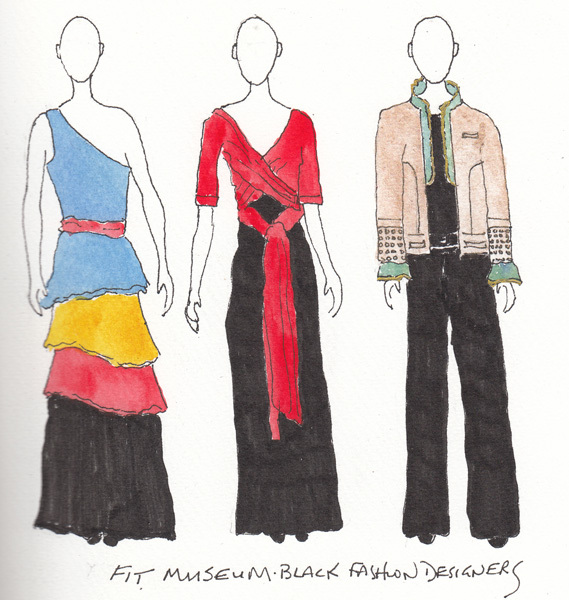 A second exhibit, Black Fashion Designers just opened and was amazing - full of clothes I would love to wear now. Proust's Muse will end on January 7th and Black Fashion Designers on May 16th. 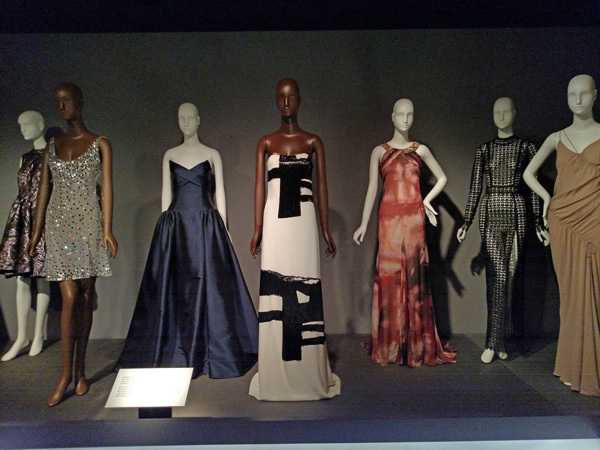 This is a photo of many terrific designs, especially the white and black evening dress. And this is my sketchbook page documenting 3 of my favorite designs. For days when I can't even imagine sketching outside of the apartment, I have 3 x 5" blank index cards and a pencil/pen in my very small purse. 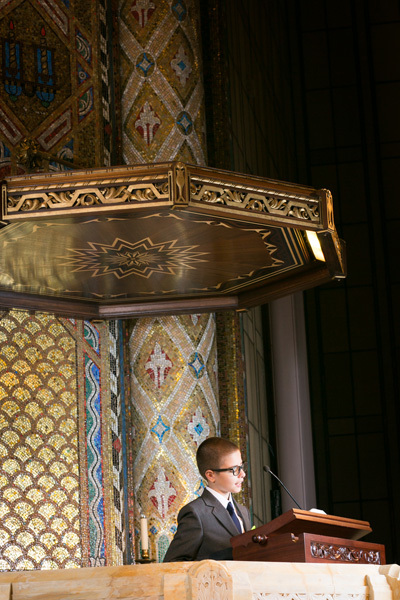 Thursday evening we took our oldest grandson to a concert by the Orchestra of St. Lukes at Temple Emanu-el. This was the synagogue in which Henry was a Bar Mitzvah one year ago. 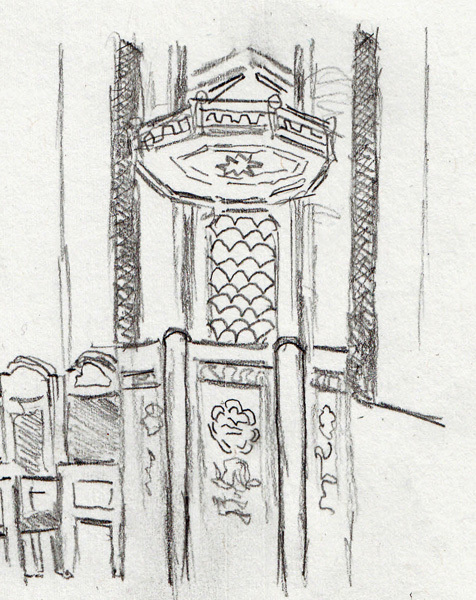 We sat in the second row of this space that seats 2500, and I suddenly realized I could sketch the place where he stood during his part of his service. Drawn with a soft graphite pencil. 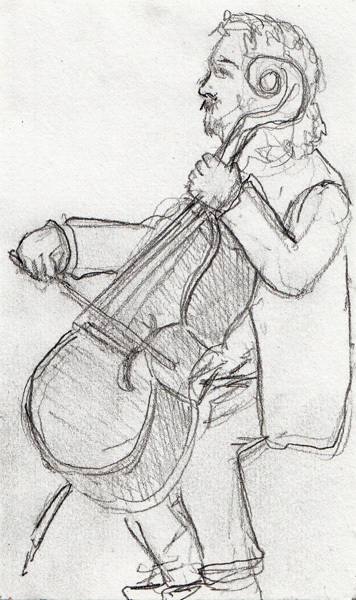 And then I sketched the cellist. 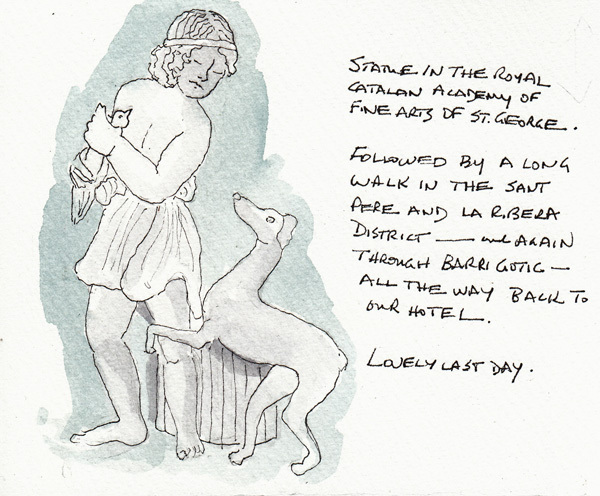 This is the final blog post from my travel sketchbook. The remainder of the pages are filled with a few photos and relevant business cards. One beautiful day we took the Metro close to Barceloneta and set off for our longest walk of the trip. We walked along the waterfront of the peninsula, past the gorgeous boats, and all the way out to the W Hotel for lunch. There are lots of outdoor restaurants adjacent to the hotel, and we stopped for a late lunch and a rest. 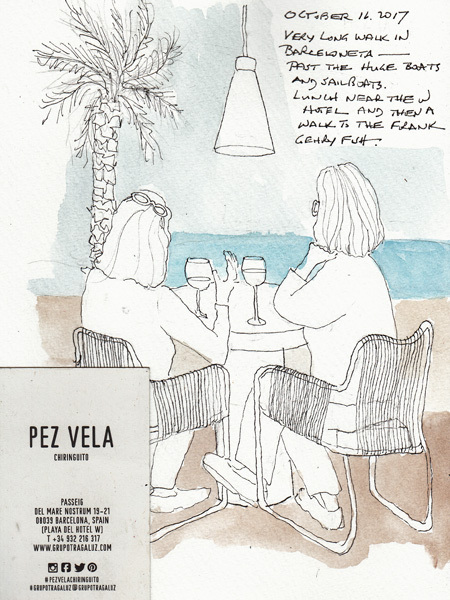 During lunch I "sketched what was in front of me," my internal guide for drawing all through this vacation. Then we continued our walk along the entire beach front where people were enjoying the warm day. 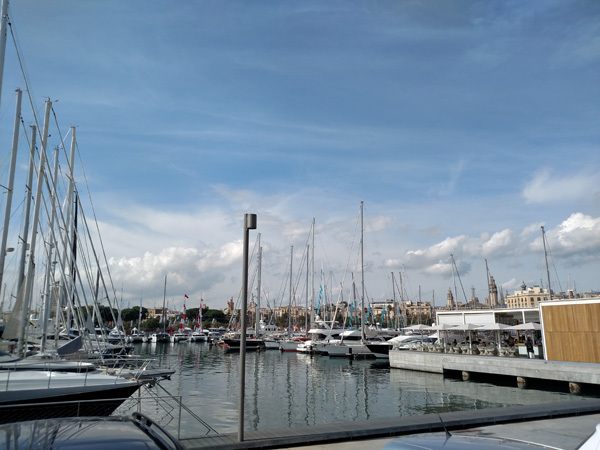 Another day we decided to walk around the western part of Eixamples, to see the area behind the University of Barcelona. There are many galleries in the area, and we enjoyed visiting them and the Museu del Modernisme which has one floor of furniture and another floor of paintings and sculpture. They had a Ramon Casas exhibit that I wanted to see, but was disappointed with the museum lighting. 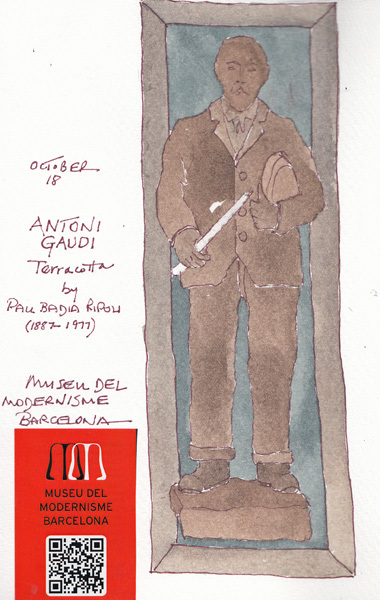 Before we left I sketched a terracotta sculpture of Antoni Gaudi. 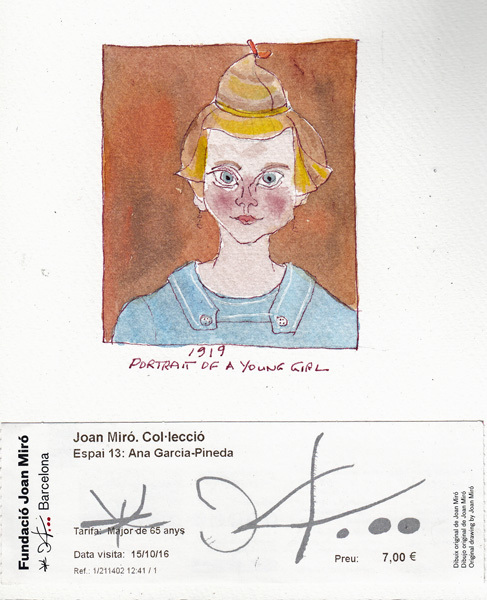 On our last day we visited the Royal Catalan Academy of Fine Arts, where Picasso, and Gaudi attended art school many years before it moved to a new location. The space is now occupied by a small museum featuring the art of the faculty from the school. 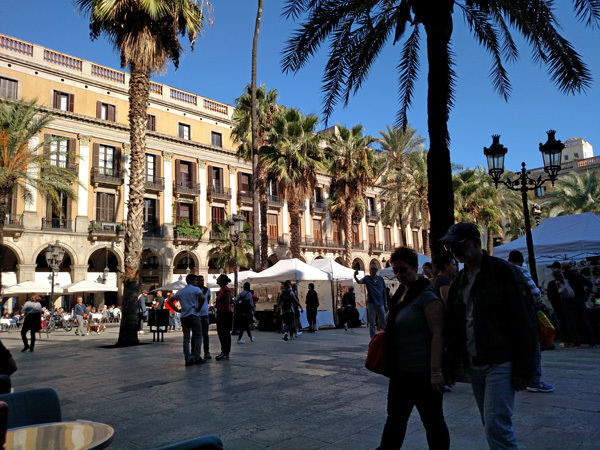 It is located in Llotja (The Maritime Exchange) and from there we enjoyed walking through Born-Ribera, and from Barri Gotic, all the way back to Eixamples. I loved this sculpture. 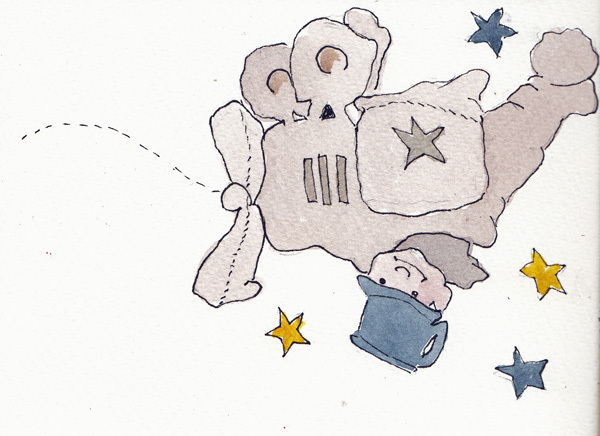 I started my sketchbook with a painting of Maurice Sendak's Micky in his bread dough airplane, and also added Mickey flying home to the last page. 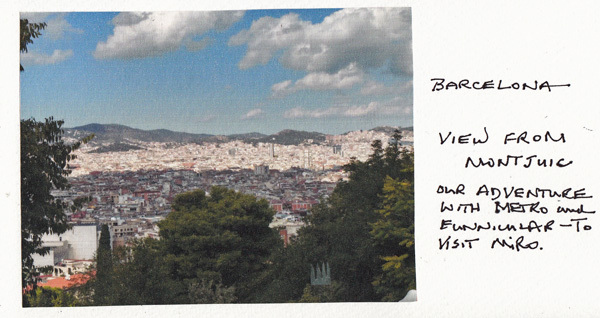 We loved Barcelona and our very leisurely exploration of this beautiful city. Last week was a blur of food shopping, cooking, cleaning up, fixing leftovers, and lots of time with wonderful family and friends. I literally didn't think about a blog post until I was awakened at 4:10 this morning by someone who called the wrong number from California. 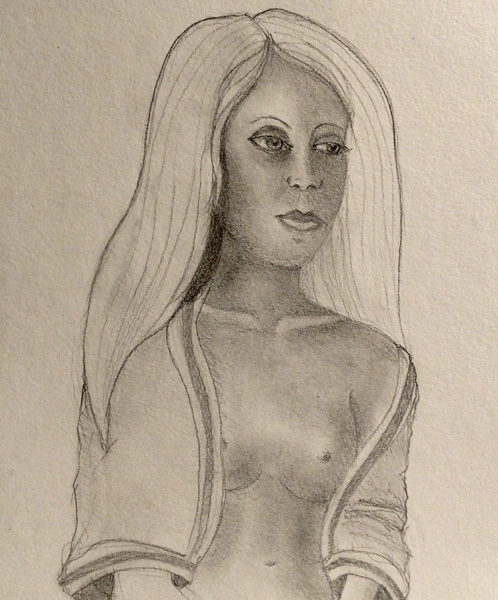 I was finished with my figure painting in my FIT class last week and spent the session doing a "portrait" of the model. My painting is still in the FIT Studio for our critique session tonight, so I haven't photographed it. I'm not thrilled with the painting, but I am achieving my goal of learning how to better use acrylic paints. I still love pen, ink, and watercolor sketchbook art, but I believe it is a good idea to shake up my brain on a regular basis, and my two acrylic painting classes have done that. We were surprised that the Metro connected directly to the funicular and disappointed that it was also in a tunnel all the way to the top. But when we got to the exit, we had beautiful views of the City. 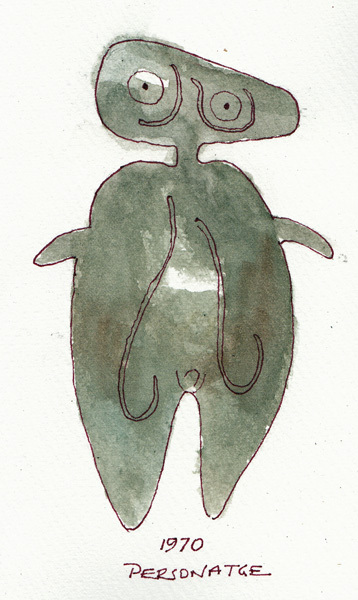 An early Miro painting and one of my favorites. I sketched it in the Museum and then painted it from a photo. 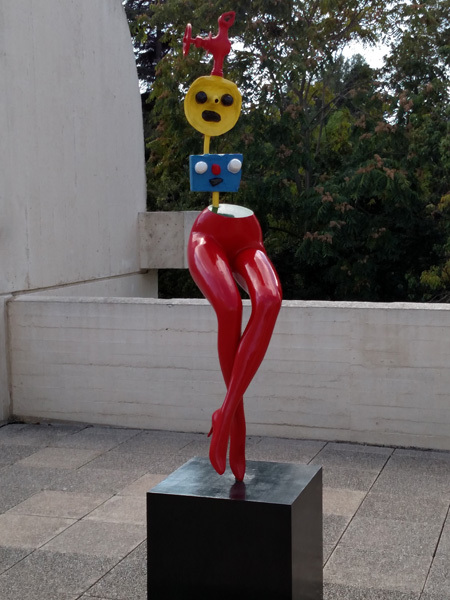 One of several Miro sculptures around the Garden. Drawing what was in front of me! 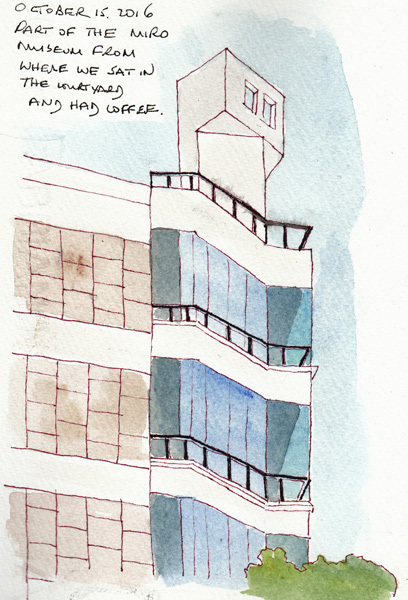 While having coffee in the outdoor Café garden I sketched the part of the Miro museum building that was in my view. It was a beautiful day and there were many wonderful Miro Sculptures on the outdoor patios on the upper floor of the beautiful building. We had a lovely visit and walked all the way back to Eixample from the Funicular exit, stopping at Placa Reial yet again for a late afternoon glass of wine.